"Cities need to become smart tourism destinations, where tourism governance and digital economy join to offer travellers diverse and authentic experiences" was the message sent out by a United Nations World Tourism Organization (UNWTO) Conference. 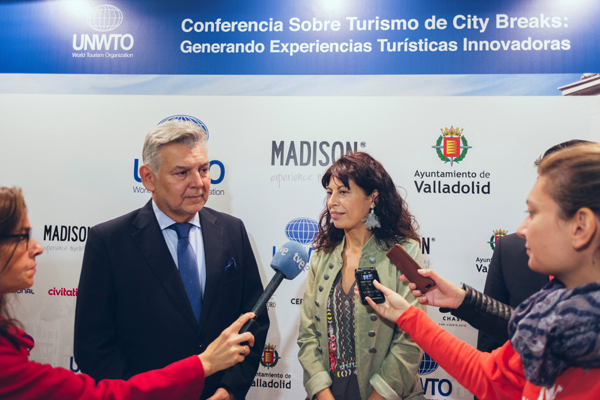 The two-day UNWTO Conference on City Breaks: Creating Innovative Tourism Experiences, which concluded on October 16 in Valladolid, Spain, brought together tourism leaders from the public and private sectors to analyse how to respond to the growing trend of city breaks as leisure experiences. The tourism leaders concluded that public-private partnerships, the inclusion of local communities and the creation of smart destinations are crucial for urban destinations to gain the knowledge and define the policies they need in order to respond to the new demands of hyper-connected and hyper-informed tourists. The deputy director-general for Tourism Development and Sustainability of the Ministry of Tourism of Spain, Ruben Lopez Pulido, suggested that cities and all destinations change their models of tourism development to respond to not only the most demanding tourists, but also to the rise of the digital and knowledge economy. “Being a smart destination is not just a label, but a process towards the comprehensive transformation of destinations, while always aiming at the achievement of the Sustainable Development Goals,” he said. Speakers at the conference included Dieter Hardt-Stremayr, president of European Cities Marketing and CEO of the Graz Tourism Office in Austria, who described what he considered key challenges for the growth of city breaks: transportation issues, seasonality, and the dispersion of tourism demand within a city and over time. “Our main challenge is to attract visitors to come right at this moment. To overcome it, destination managers should focus on parts of the tourism offer that are ‘temporary’,” he concluded. The main conclusions of the conference referred to urban tourism governance models. Participants highlighted that, with the growth of high-speed, low-cost transportation links that provide more and more visitors with access to city breaks, city destinations must respond by prioritising investments that benefit residents and tourists alike. They also concluded that with the technological advances that allow the creation of smart destinations, destination management organisations must shift their focus from only promoting the experiences available for tourists in cities, to managing urban tourism in all its complexity. For their part, tourism policy makers should use smart destination tools to study the impact of tourism on the profitability and sustainability of a city, and place the destination at the centre of policy changes. These conclusions will be taken into account in the UNWTO work plan on urban tourism.